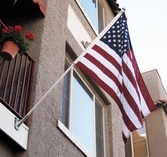 A wonderful & patriotic upgrade to your flagpole over the standard gold ball! Our eagle is cast perched above a smaller gold ball. This durable, gold bronze eagle flagpole ornament measures 9". Not suggested to be used with the solar light.